Crafted from our Athletic Performance Fabric; this shirt is as light, soft and stretchy as it gets. 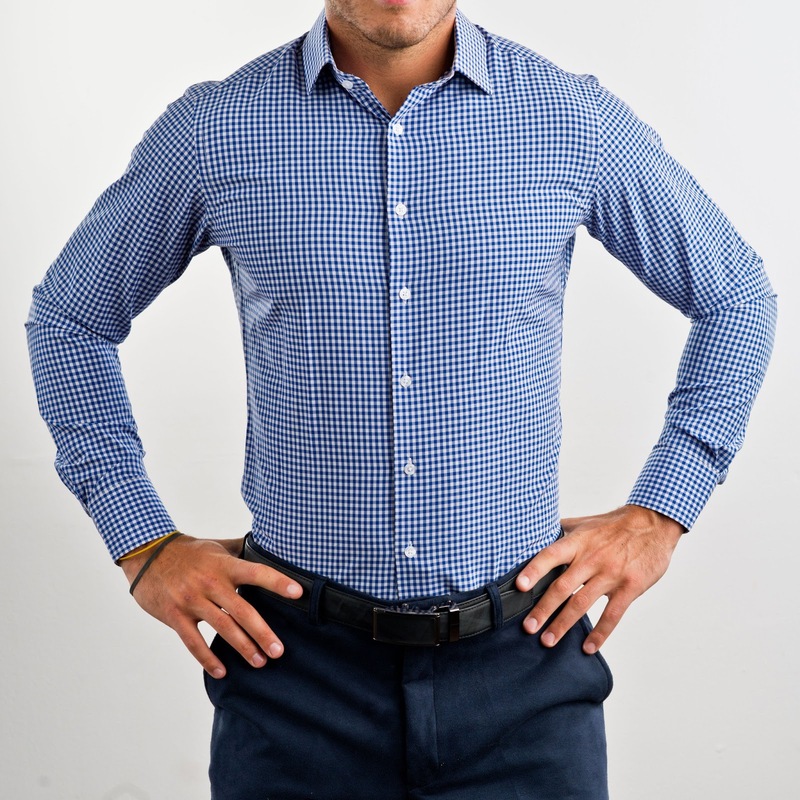 "The Kopitar" is the perfect dress shirt for business or casual wear. A common issue for a lot of guys who are in shape is finding button up shirts that fit well. The problem is that our proportions are unlike that of the average male as we typically have chests and shoulders that are much wider than our waists (i.e. a classic v-taper shape). This means that most off the rack button up shirts don’t fit us particularly well. They are either fit too tight through the chest and arms or too baggy through the midsection. A quality dress shirt that looks good, feels great and doesn’t cripple your wallet? This used to be impossible to find! Until I found State and Liberty shirts. I threw the shirt in the dryer for 15 minutes to freshen it up. Once I pulled the shirt out of the dryer, wrinkle free and feeling as though it had been pressed, I noticed it had a feel to it like no other dress shirt I’ve encountered. It felt stretchy, yet supple. Relaxed, yet ample and up to the task. I pulled the shirt over my torso and was befuddled at how the shirt fit me so well, as I had casually requested a “large” sample. There were no previously exchanged measurements, or painstaking trips to the Men’s Warehouse to act like I was buying a dress shirt in order to acquire my exact dimensions. And yet, the shirt fit my torso perfectly, with perfect sleeve length to match. It even made my biceps look outstanding thanks to the superior fit. They were pretty accurate with the description of the fit! Also, this tag was a nice touch and really gave it a high-quality feel to the whole transaction. I love that the white and blue are not solid; they have the other colors woven in. I'm not a clothing connoisseur, but I love the way the material looks as well as feels. It is surprisingly soft. These look great and the buttoned down collar is a nice touch to keep the collar in shape and in place all day. Stiff cuffs, stiff collar, tight on the arms, up tight into the pit. The shirt hugs the forearms and arms. Not baggy in the front, back or side. No wasted material anywhere.